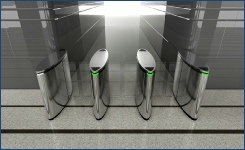 Our RG range of stylish yet robust retractable speed gates are ideal for cooperate reception areas, stadiums, and library's. The RG range provides high pedestrian throughput in an elegant, sophisticated and discreet manner, essential for today’s corporate environment. All our retractable speed gates can be installed in either a single or a multi-lane array. If wide access is required than the gates can be used in conjunction with our SG100 swing gate. 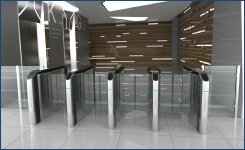 When installed in conjunction with any form of access control system, paddle gates provide a low to medium level of pedestrian entrance control security.